Lara Mirinjian is an immensely talented pianist and entrepreneur whose passion for music has driven her to create an online piano course for beginners. Lara’s unique approach is to teach her students the foundation of music based on rhythm, ensuring they learn this crucial element in order for them to have a full understanding of music. Lara will hold two introductory classes for adults on July 1st; the first from 6-7pm and the second from 7-8pm right here at Work Evolution. To stay updated with Lara’s piano lessons and online courses, visit her website at www.larasmusic.com. Agenda Trade Show’s impact on Long Beach, Los Angeles, and all of Southern California is a study of not only the effect of counterculture on society, but also of how over 750 lifestyle brands can change the economic landscape. Varying from Nike to Obey, Zero Skateboards to Lunar Socks, there truly is something for everyone - from industry insiders to impatient and dedicated fans. Looking back to last January’s Agenda, covered in detail by WE Labs’ own Sarah Bennett, one can see how the city of Long Beach quickly became a leader in the buying and selling of surf, skate, sneaker and streetwear brands. “There have been brands that their whole career has been launched here,” says Agenda founder Aaron Levant, who personally chooses which brands get invited to buy booths each year. “The retailers and buyers they met with and the press they got from this event has literally changed and made their brand and that’s a really cool thing to be a part of—these entrepreneurs fulfilling their dreams and chasing their passions.” - Click for more of Sarah's article in the LB Post. As a creative collaborative coworkspace dedicated to helping entrepreneurs and small businesses grow, all of us here at WE Labs know the feeling Mr. Levant describes above and couldn’t be more excited to see the evolution of Agenda in our own back yard. “[A]fter 11 years in business, Agenda has become much more than just a place where youth culture brands come to make sales in sunny SoCal. It has expanded to become an all-encompassing celebration of the California lifestyle with live art, daytime drinking, a food truck court and celebrity sightings from Famous Stars and Straps owner (and Blink 182 drummer) Travis Barker to Long Beach luminary Snoop Dogg, who this year had no less than three collaborations with different brands featured across Agenda.” - Click for more of Sarah's article in the LB Post. As for this year? The 2015 Agenda Trade Show has worldwide appeal and showcases how to build brands from the ground up. The Long Beach convention center is the perfect forum; hosting Agenda positions our city at the crossroads of small business and entrepreneurial growth. An expanded women’s section highlights a growing sector within the lifestyle retail market. There was a notable uptick in designers focusing brands exclusively on women this year, a welcome sign in this traditionally male dominated industry. 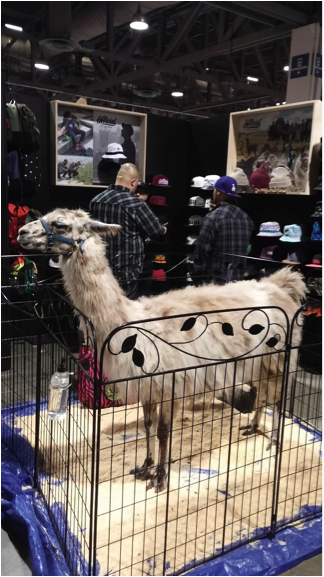 The intensity was palpable, as Agenda benefited from not only being the first trade show of the 2015 season, but also from the cold weather preceding it: “A cold snap in December pushed a higher demand for apparel, retailers said. A few days after the New Year, Agenda booths were packed with buyers, according to vendors.” - Click for more from Andrew Asch on Agenda 2015. On the trade show floor Long Beach small business owners could see firsthand how an original idea combined with the right niche market can create billion dollar trends that move markets. This intrepid WE Labs representative was reinvigorated after immersing myself in the action - coworking goes hand in hand with the independent and fresh minded thinking that leapt off the convention floor. I couldn’t help but picture how these businesses would flourish within WE Labs’ creative environment, and am even more excited as I look forward to seeing our members represent Long Beach and make the transition to exhibitors in coming years. You can catch the video walk-through tour of the workspace here. WE didn’t realize WE’d scheduled PitchLab: Pitch or Treat on the night that would be game 7 of the World Series until the celebratory cheer from every watering hole in Downtown Long Beach filled the air around our 8th floor perch in the Pacific Tower. However, not even sports history could keep the entrepreneurs and visionaries from our most popular monthly event (and the spread from Beachwood BBQ probably had something to do with it too). But more on that in a second. Our featured feedback panel for the October PitchLab included Mike Daniel, director of the Long Beach SBDC Service Center, and Lisa Mastramico, director of PADNET at the Long Beach Community Action Partnership. They lent their feedback to ideas ranging from a veteran’s art program, to a hip-hop festival, to an app that allows you to treat your friends to dinner or buy them a drink with your smartphone. But the most important part of PitchLab is the open networking mixer after the pitches. It’s always easier to make connections and create friendships among creative individuals when WE can establish some common gastronomic ground, and that’s where Brandon at Beachwood BBQ came in. This month he provided pork, chicken, and brisket with their delicious array of sauces. And oh yes, there was beer. Please join us for our next PitchLab on December 3rd at 6:30pm. Keep an eye on our newsletter for updates and announcements, including who will be on our featured feedback panel and what sponsored goodies will be tempting us this time! This will be our last PitchLab of 2014, so come join us to celebrate the closing of one year and all the possibilities in the new one!